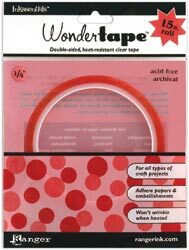 Ranger Wonder Tape 15 Feet/Roll, 1/4" Wide A double-sided, super-sticky, clear mylar tape that is heat-resistant, will not lift or curl and holds small embellishments to paper permanently. Use on photos, papers, chipboard, matboard, foamcore, embossing powder, flocking, foil, glitter, small beads and more. Acid free and archival safe.